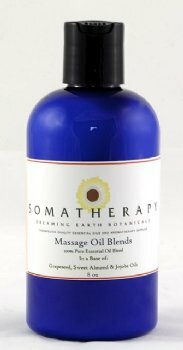 Essential Oils of Frankincense, Lavender and Petitgrain in our Massage Base Oil (Almond, Grapeseed and Jojoba). Use straight from the bottle for an energizing and invigorating massage or add a capful to a warm bath to uplift and energize the spirit. Read more about using aromatherapy for Chronic Fatigue Syndrome. Review: I know that this is a blend for Chronic Fatigue, but it has quickly become my and my client's favorite oil for relaxation. Just enough fragrance. Not too sweet. It is amazing. I also like that I have an oil specifically for my Chronic Fatigue clients! LOVE IT!